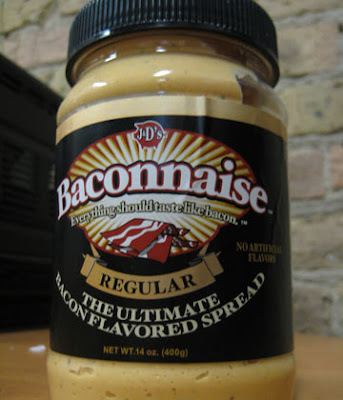 About The Recent Inactivity And Something Called Baconnaise. Sorry for the inactivity here recently. I had a lot of work and was very busy… Hmm that’s not going to stick is it? Ok to tell the truth I wasn’t busy, I got lazy and have been chilling out in front of the xbox 360 while eating pizza. I have realised a couple of things while being in a vegetative state of can’t be arsed. First, homemade pizza (thanks dad) is awesome. Second, Twitter is a fantastic way to receive news and information. Third, … Oh wait I didn’t have a third point silly me. To make up for the recent inactivity here I shall show you something that is quite weird and rather disgusting, not only in idea but i suspect in taste too. Yes it looks rather sickening doesn’t it. If you were eating something I am very sorry as its probably all over your lap and the computer monitor now. I am rather curious of the fact that it says Regular on the front of it. Does this mean it comes in different varieties? Also, who is this aimed at? What kind of person would buy this instead of the real thing? Well readers, I wish you good day and again, I apologise for the lack of posts recently.